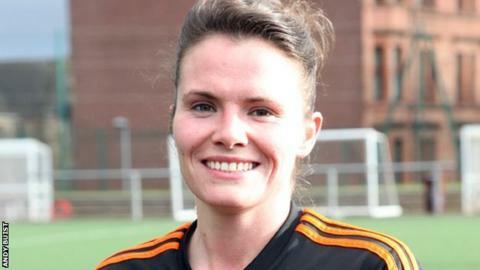 Glasgow City moved two points clear at the summit of the Scottish Women's Premier League, as Hibernian dropped their first points of the season. Jo Love and Leanne Ross both hit hat-tricks as Glasgow beat Inverness 10-0. Hibs lost 3-0 at Rangers, with Erin Cuthbert, Lisa Swanson and Hayley Cunningham on target. Sarah Ewen scored six and Kerry Montgomery grabbed four goals as a young Forfar Farmington side slumped to a 16-0 defeat at Spartans. Aberdeen's Nikki Wright netted the winner in a 3-2 triumph over Hamilton, and Queen's Park drew 3-3 with Hutchison Vale. Celtic cruised to a 10-0 home win over bottom club Buchan. Glasgow City are now on 15 points, Rangers are two behind, and Celtic and Hibs are on 12 points.